My newest book is a historical fantasy, Enchantress: A Novel of Rav Hisda’s Daughter. Fantastic tales of demons and the Evil Eye, magical incantations, and powerful attractions abound in this novel that weaves together Talmudic lore, ancient Jewish magic, and a timeless love story set in 4th-century Babylonia, the land where “abracadabra” originated. I’m a native of Los Angeles, where I still live. I was a clinical chemist for over 30 years with Kaiser Permanente before I self-published my first novel, Rashi’s Daughters: Book 1 – Joheved, in 2005. I began writing it in 1997, with no previous literary experience other than being a voracious reader. It sold so well [26,000 copies in 18 months] that the big NYC publishers came calling and I ended up with Plume Books, a division of Penguin, taking on the entire Rashi’s Daughters trilogy. In 1992 I began studying Talmud in a women’s class [women not permitted to study Talmud with men at this time]. I came across a curious piece of Talmud that has Rav Hisda’s daughter sitting in her father’s classroom when he suddenly calls up his two best students and asks her, “Who do you want to marry?” Astonishingly, she replies, “Both of them,” after which the younger suitor says, “I’ll be the last one.” Even more astonishingly, that is what ultimately happens. First she marries the older student, and then, after being widowed, the other one. I was so impressed with her audacity that I had to write her story. The title of the first volume of the series, Rav Hisda’s Daughter: Book 1 – Apprentice, made too many people think it was a non-fiction history text, not a historical novel. So for volume two, the order was changed to Enchantress: A Novel of Rav Hisda’s Daughter. I needed names for other female characters as well. Luckily I came across something called “Babylonian incantation bowls.” Unearthed under homes in what is now Iraq, the land where the Talmud was created, these consisted of common household pottery inscribed with spells to protect the inhabitants from demons and the Evil Eye, which were believed to cause illness, unsuccessful pregnancy, and other such misfortune. Clearly of Jewish origin, the incantations are written with Hebrew letters, quote Torah, and call upon Jewish angels and divine names. The clients to be protected were included, along with their mothers’ names, giving me a large number of Jewish women’s names from the exact time and place I was writing about. Getting the story down in the first place. Research is fun for me, and editing/polishing is more time consuming than difficult. I learned a tremendous amount about the lives of Jewish women in 4th century Babylonia, as well as the rabbis who created the Talmud. Most surprising was discovering how ubiquitous and accepted magic was in that society, how sorcery was a prestigious profession for women. Be passionate about your subject, it will come through in your writing. Know the audience for your book and how you’re going to reach them. Don’t write to make lots of money or become famous. My target audience is Jewish women in general. My perfect reader is probably a woman rabbi, since she would not only enjoy the story but also appreciate the Talmud research that went into it. I do lots of speaking about my research, and travel extensively to lecture to various Jewish and women’s organizations. I also have a website, as well as a blog. Of course, I’m active on social media like Facebook, Twitter, LinkedIn, Goodreads, and Google+. 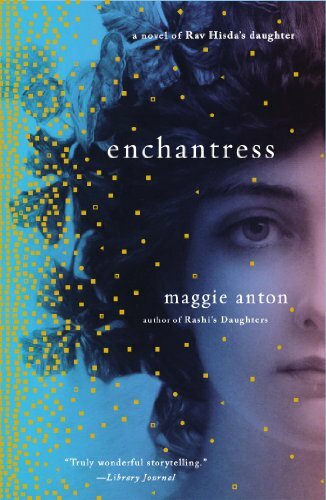 For Enchantress, I’ve branched out to do a blog tour on over 25 sites that appeal to Jewish women or historical fiction fans.